In January 2008, when Ethan was 14, his father, Tom Mitchell, WY3H, took him to a Mahoning Valley Radio Club test session held at Youngstown State University, Youngstown, Ohio to take his Technician Class test. He passed that test with ease. In July, 2008, now age 15, Ethan returned to the same test session site and passed the General Class Examination. Ethan is an identical twin. His brother is Ariel. Both boys are interested in computer science and both boys taught themselves HTML programming and Web Site design from books they read at home. Both boys also taught themselves to play the key board by ear. 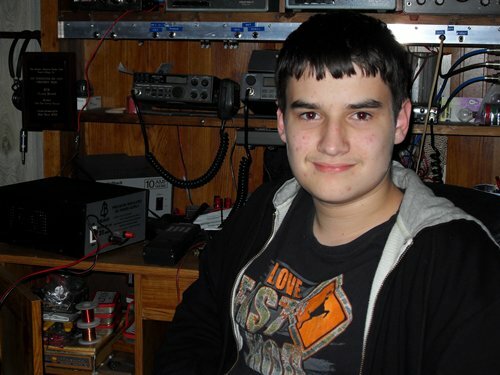 Although Ethan likes all aspects of Amateur Radio he likes CW the best and is presently trying to increase his code speed. In addition to their other interests both boys also enjoy riding their bicycles, skateboarding and they both enjoy shooting sports, mostly trap shooting, shooting muzzleloading rifles and .22 rifles. Since Ethan obtained his General Class ticket, it seems to have inspired his brother to study for his Technician Class. It's worth mentioning that at one time (going back maybe 40, 50 years or more) both Kittanning and neighboring Ford City high schools had active amateur radio clubs. Today, however, the picture has changed. Ethan is presently the only student in the entire Armstrong School District who holds an amateur license. He volunteered to serve the NAQCC by acting as assistant Web Master under the direction of John, K3WWP, NAQCC # 0002. Ethan is NAQCC # 2222 and Fists Member # 13964. Ethan lives with his family in Manor Township, between Kittanning and Ford City, Armstrong County, Pa. His Mom is JoAnne, and she is a Wisconsin gal and a die hard Green Bay Packer fan. Although the family lives in "Steeler Country," she passed her packer devotion on to Ethan and Ariel. (Dad tries hard to remain neutral).